The Insigne Sancti Georgii (Saint George Medal/Award) is for adult leaders in Scouting programs, and it is intended to be given to those adults who give exceptional service to both scouting and the Faith. There is not a set list of requirements to complete for this award as there is for the youth awards. Rather, the merit of each nomination is carefully considered based on a specific meritorious act or the totality of service to God, Scouting, and community. Candidates for this award need not have earned any of the youth religious emblems. However, significant assistance in helping youth in their spiritual formation by guiding them through the process of earning the religious emblems is generally expected. 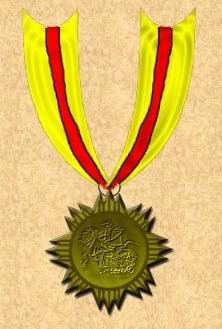 The award (see example on left) is worn on a neck ribbon. Some Scouting organizations also have generic badges that may be worn to represent receipt of an adult religious emblem. The Saint George medal may be given to those of other branches of the Christian Faith, particularly those of Catholic tradition, as well as to those not in Boy Scouting who demonstrate significant leadership and service to God and country. The award is given by a diocesan bishop within the Anglican Rite Roman Catholic Church upon recommendation of the Scout Chaplain. Application may not be made for the award. Rather, nominations are made a committee selected for the purpose.